The Whisky Shall Come To You Final! So my wife and I have been planning on going to the whisky bar in our city for months now. Every time we make plans SOMETHING always come up. I get called into work a day early, we can't afford to go out, a public holiday that we forgot about is occurring on the day we're going and they're closed or as just happened this last time around, my wife and I got sick. This has been extremely frustrating for me as this bar has quite a few whiskies I've been meaning to try for a while and so as the day was ending yesterday I was feeling a wee bit down. To the rescue comes my brother in law! I get a text message from him saying "If you can't go to the whisky then the whisky shall come to you!" A couple hours later my brother and sister in law arrive at the house and he brings with him a bag of whisky. In this bag are a couple whiskies I've never had before along with a couple I've tasted. Now the first 4 bottles of his collection I just recently reviewed. The Macallan 10 yr old Sherry Cask, Sazerac Straight Rye Whisky, Johnny Drum bourbon, and Lagavulin 16 yr old. 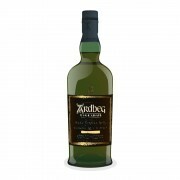 The last bottle on the tasting block tonight was the highlight of the night: Ardbeg Uigeadail!!! Now as you may have noticed in my last review which was the Lagavulin 16 yr old, I'm not a huge smoke and peat head. Amusingly enough if you've ever had Ardbeg, pretty much any Ardbeg, you know it's ALOT of smoke and ALOT of peat hahaha. I poured myself a hefty dram as I was going to be tasting this tonight and tomorrow for this review. I handed the glass to my wife who took one whiff and went "Whoa!! Burnt bandaids!!" As I smell this dram I get sherry with smoke and peat and quite a bit of phenols. Now this is the second time I've had this whisky, both from the same bottle. At this tasting the bottle had been open for several months and was down to just a few drams left. At the first tasting smoke with sherry and TONS of phenols and burnt bandaids came through. As I immediately noticed this bottle has opened up and oxidized and the nose profile has changed abit. I'm very curious as to how the flavor profile has changed. My wife immediately declined to taste this bottle this time as she is very much not an Islay fan. So I'm blessed with just having this to myself! Now this bottle is sitting at around 108.4 proof. And it does have that taste but it's not overpowering. On first sip the peat jumps to the front of my tongue and then smoke with the phenols, specifically the burnt bandaids. There is the taste of sea air on my tongue and some brine. For sweetness the sherry shines through. This is quite an enjoyable whisky. I've not had the Ardbeg 10 yr old or the Corryvakin yet and I'm keen to try them after this bottle. I'd be quite keen to also try this bottle just after opening and see how the flavors differ. The finish is quite long with the alcohol biting quite abit and the smoke, peat and bandaids linger on the tongue for a while. This is a very nice whisky and another one I wouldn't mind having on hand when I really want to taste some heavy smoke. However the price might be a little out of my range for a casual bottle. This bottle sits at around $135 AUS and can be a little difficult to put your hands on over here. This is a good complex whisky, but I'd NEVER use this or any Ardbeg to introduce any whisky novice to Single Malts. Now the ratings on this review are given based upon a bottle that has been oxidizing for quite a while and does tempt me to buy a bottle or try a newly opened bottle as soon as I can get a chance! The big reason for the difference in score was I think more due to oxidization then anything else. The bottle of Lagavulin had semi recently been open and was still opening up so the flavor profile was for me extremely concentrated and was quite enjoyable even more as it opened up in the glass the next day. 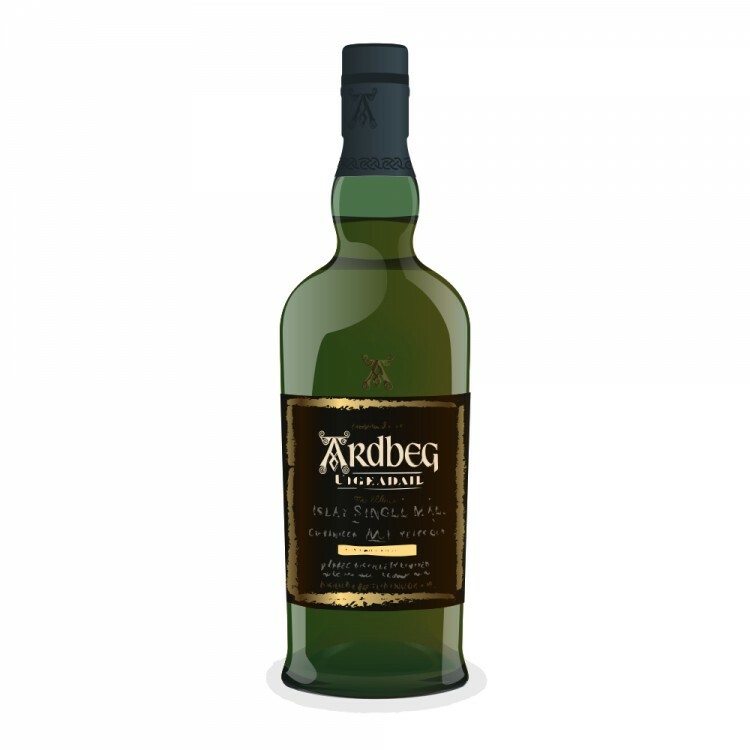 The Ardbeg was good, but I had a dram from the same bottle shortly after it was opened (somewhere along 6 months ago) and the flavor profile was quite different and much stronger when I tasted it compared to the last couple nights drinking the Ardbeg. The flavors seemed a little . . . wishy washy for me? It is still a very good bottle, but I'd like to do a tasting/review on a freshly opened bottle in the future as I believe the Ardbeg would score higher then 86. The other difference in score for me was price. The Lagavulin was roughly $100 to purchase while the Ardbeg was picked up at around $135. They're both VERY good whiskies (I have some good recollections on the Uigeadail from when I first tasted it) but in this tasting the Lagavulin won out. As I can purchase them I'll be doing updated reviews on both the Ardbeg and the Macallan as I felt that oxidation had affected both bottles pretty severely. And I'd like a retaste where the nose and flavors were more concentrated without months exposed to the air. I have just retasted the Uigeadail and I have raised the initial score that I had given it up to a 92. I still feel that the Lagavulin is a still a better price for the money, but the flavors that came through my glencairn tonight were very lovely and nice and strong. I'm thinking that maybe the Lagavulin had washed out some of the lovely Ardbeg flavors for me the other night. Sorry if there was any confusion! Thank you for the kind words my friend. My father in law is ordering a bottle of the Corryvackin which I am VERY eager to try!! I got a 5cl sample of this too, but wasnt tasting it yet. I am looking forward to try it soon. Guess you are writing a review there too? Would be great stuff. Yeah once I can get my hands on it I'll post a review on it. It's been on my to try list for months now so I'm very eager and hopeful that it arrives soon! I've heard nothing but good stuff about it!